Hello, Internet! It’s been a little while since I’ve written one of these, but I certainly wanted to get back in the saddle! The way news and other things have lined up, it’s just been a little harder to find the time. But we’re back in action, and ready to talk news and nerfs! Nothing of note to discuss on the Paladins front I’m afraid, but I do want to say I plan on getting back to doing Champion Writeups. I have not been as vigilant on that front, despite loving the game, so I’m going to get back to it. Maybe do some of the older characters? I’d love to have your thoughts/feedback! Today we focus on Smite’s patch and a little bit of chatter on Realm Royale. With so many games being playable in their Alpha/Beta state these days, people seem to have forgotten the point of the Alpha/Beta phase of testing. You know what the keyword is there? Testing. So, I’m going to help out. Dictionary.com defines Test as a noun, “the means by which the presence, quality, or genuineness of anything is determined; a means of trial”. The purpose of an Alpha Test isn’t to have fun and be the best. It’s to try things, get the game ready for Beta Testing, and then ship it to a full launch. The purpose is to find what works, what doesn’t work. Back in the 80s/90s, it wasn’t feasible to have so many people in an Alpha, so you did not see a game until it was ready to go (that is, until MMOs, I suppose). 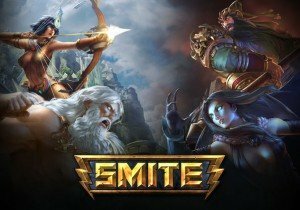 This isn’t being written because I love most Hirez games (though I do), it’s because it’s all I see. People are complaining about choices made in an Alpha. That’s fine, it’s in testing, it’s meant to be discussed, and if necessary, changed. But pitchforks and torches do not polite discourse make. Realm Royale is the first Battle Royale game that I’ve honestly enjoyed. Are there things I don’t like about it? Of course, nothing is perfect outside of EarthBound. Not too wild about insanely powerful SMGs, or the insane power of Mages. I mostly play Engineer and agree that maybe they don’t need an Area-of-Effect heal (But I plan on using it as long as I have it). Let’s be adults about it, yeah? I want it to be the best game it can be, but nobody needs to be shouted down on Twitter for decisions made. It’s not too late, it’s not “dying”, it’s not even out of Alpha Testing yet. But with that said, let’s talk about the patch for Smite that’s going live today! First, can I just say how glad I am that this year’s T5 skin will be a Guardian skin? That it’s guaranteed that the Tank community will have something marvelous and majestic? Honestly, all Guardian mains should receive it for free, as a thank you for their service. That said, I want it to be Ares, but I don’t see as many possibilities as I do for Ganesha. But I play both Guardians about the same amount, so no matter who wins, I win! Isn’t that what matters most? We have some incredible skins coming in this update, and I think my favorite is Baroness Izanami. This is, to my recollection, the first “Rule 63” character skin – For every male character, there is a female version of that character (and vice versa). Cyberfox Da Ji did look a little bit like another character in another game, but not a copy/clone like some folks have said. Primal Fire Ares is amazing, but it’s no match for my favorite Ares skin (Abyssal Knight). But Shadow Spirit Ah Puch is another wonderful one, and finally, I have a skin for Ah Puch that I don’t think is weird, unsettling, or unnerving. The blues and blacks are a wonderful physical aesthetic. Out of the other cosmetic stuff, I like the “International Announcer Pack Bundle”, just because I think it’s fascinating. The Awesome Chest received new content, as did the Fantasy Points Store. Man, shoes sure got an upgrade here in this patch! Reinforced Greaves (Health: 75 to 100, Stacks: 6 to 7), Travelers Shoes (Magical Power: 20 to 25), Talaria Boots (Physical Power: 15 to 20), and Reinforced Shoes (Health: 75 to 100, Stacks: 6 to 7) all received some updates. This is also an update to help Magical carries just a little bit, which is a dangerous proposition. They always seem to be pick-or-ban tier, or who cares tier. Demonic Grip is a key Magical Carry item, that gives the Attack Speed they need, but is lacking some of the punch to deal the damage. With that it saw some upgrading (Magical Power: 50 to 65). Another item that’s key to the Magical Carry gods is Telkhines Ring, which is getting a boost as well to increase its power and its scaling on the passive (Magical Power: 7o to 90, Power Scaling on Passive: 8% to 10%). It’s a very difficult thing I think, to balance them just right, and a large part of me thinks that maybe they shouldn’t be. If everything is balanced, things become stale and boring. I’m looking forward to seeing how these rings change how people cry about Freya. Is it a shock to anyone that Baron Samedi got some nerfs? No? Nobody? Every single one of his abilities saw some kind of change, from bug fixes to actual damage. Life of the Party (Damage on Hit: 140/210/280/350/420 to 100/170/240/310/380) and Vivid Gaze (Issue Fix: Second Beam did 30% of the first beam’s damage, rather than 15, Magical Power: 80% to 70%) saw some tune-down on the damage. In addition, Hysteria saw its passive weakened (Bonus Damage: 25% to 20%), but I’m not 100% certain it is quite enough. We’ll have to see though. But that 25% damage buff was absolutely insane, and it was very very easy to get. Then you could grab the Damage Amplification through a relic and cackle as people melted under your vivid gaze. Wrap It Up also saw a bug fix, where people with Root Immunity were still being Rooted. The Baron came out swinging, perhaps (definitely) a bit too hard. You know who else got some changes? Fafnir. Everyone complained about how strong he was, but he has to practically dump his entire mana pool just to do it. He has to use all of his abilities just to be effective, twice when using his ultimate. So, he saw some mana reduction in Underhanded Tactics (Mana Cost: 70 to 60) and Draconic Corruption (Mana Cost: 100 to 70). He also gained more base HP5 (5 to 7), which may help a little bit. Now his HP5 is more in line with the other Guardians. I’m always game for an Artemis nerf, because damn if she’s not powerful. In particular, her ability to kite people thanks to the CC immunity of her ultimate, Calydonian Boar. It saw a decrease in her CC Immunity (3s down to 1.5s) so now it should be possible to actually catch up and stop Artemis from nuking your carry/whomever else she decides to murder with arrows. Tusky saw no changes, just Artemis’ Immunity. Athena also saw a bit of a nerf, and while I understand and respect the choice, I do not like it, as I enjoy playing Athena whenever I get the chance. It’s not an insane change, but the focus is on the damage of her late-game ultimate, which can really be a game changer. There will be a little less of Athena’s strategy of diving, getting the other team to burn cooldowns, recall, ult back in and fight some more. Well, no, it’ll still happen, but it will do less devastating damage as Defender of Olympus saw a damage decrease and cooldown increase (Base Damage: 350/450/550/650/750 to 350/430/510/590/670, Increased Cooldown: 110/105/100/95/90 to 110s at all ranks). This, of course, isn’t all of the changes this week. The patch notes are below for the Chernobog adjustment, Mercury and more! But these are the ones I wanted to address as “most important” to me. I missed doing these, and want to expand the stuff I write about in them beyond patch notes and updates. What do you want me to talk about? Theorycrafting/building stuff? Put my Paladins Champion thoughts here? I’d love to know!